Day 2 began with дождь (rain). On and off, it spent the next two days raining. 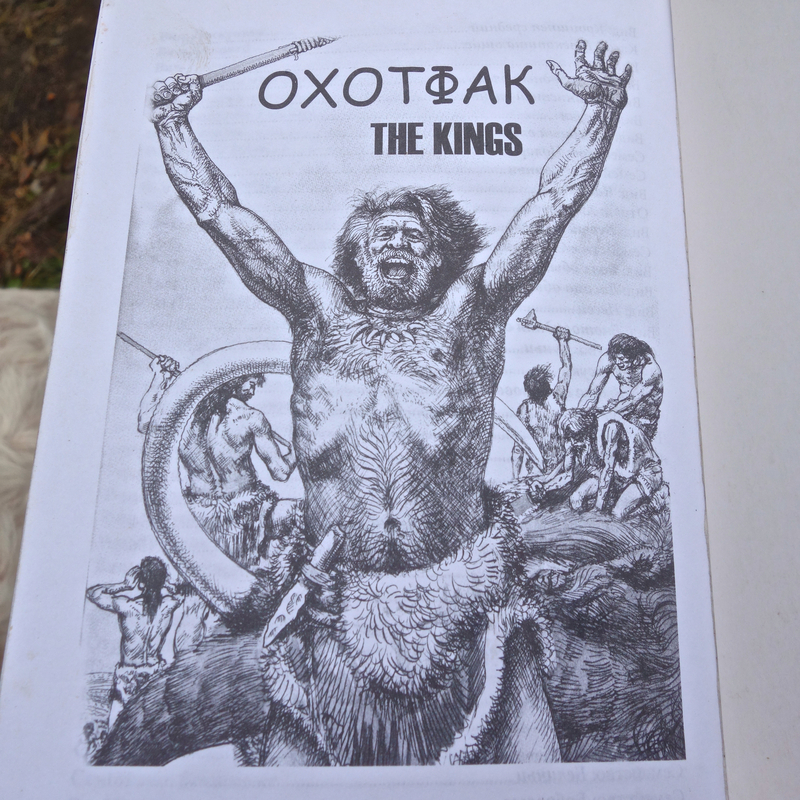 We woke up at about 8am, in most cases, wearing our hunting garments from the day prior. 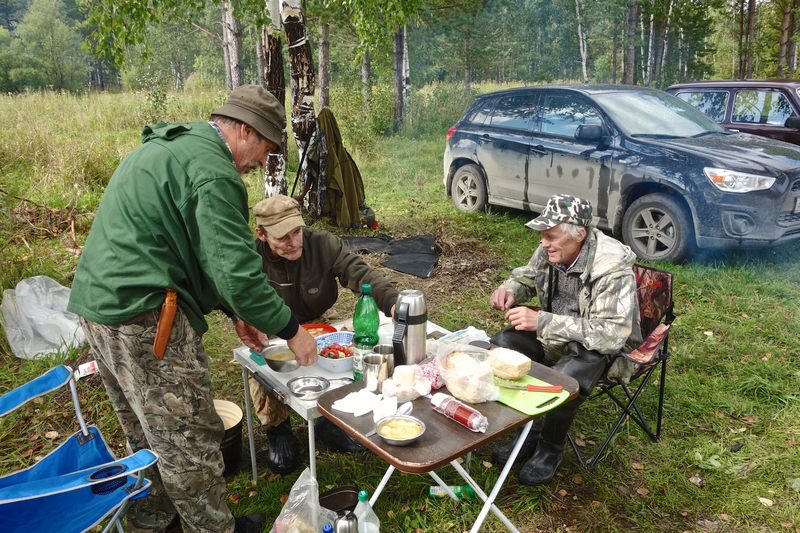 After putting on rain garments, we ate a quick breakfast, mostly cold foods (bread, sausage, cheese) but also small molasses biscuits called пряники. 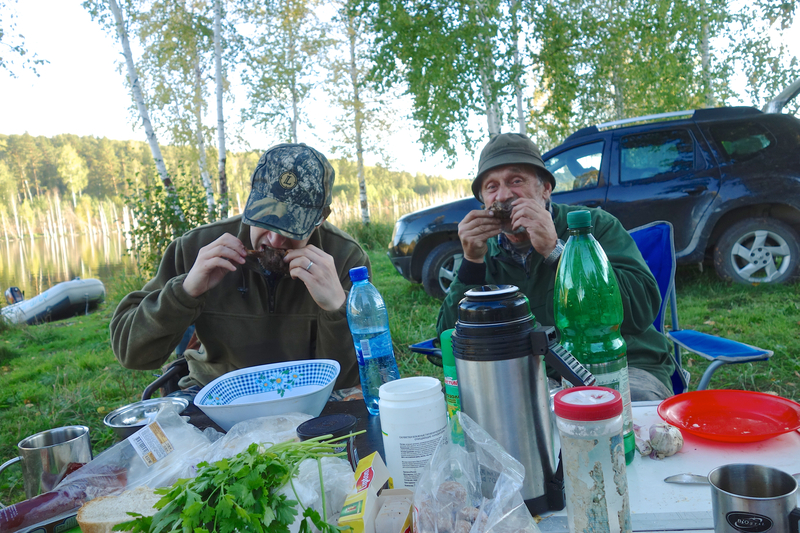 After breakfast, we got on the boats and traveled three miles to an area said to be flush with рябчик (hazel grouse) and вальдшнеп (woodcock). We split into two groups. 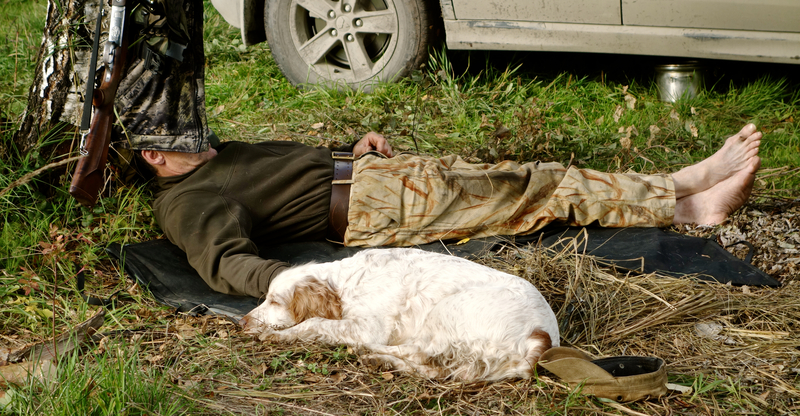 The first consisted of me, two hunters and Charlie the gun dog. 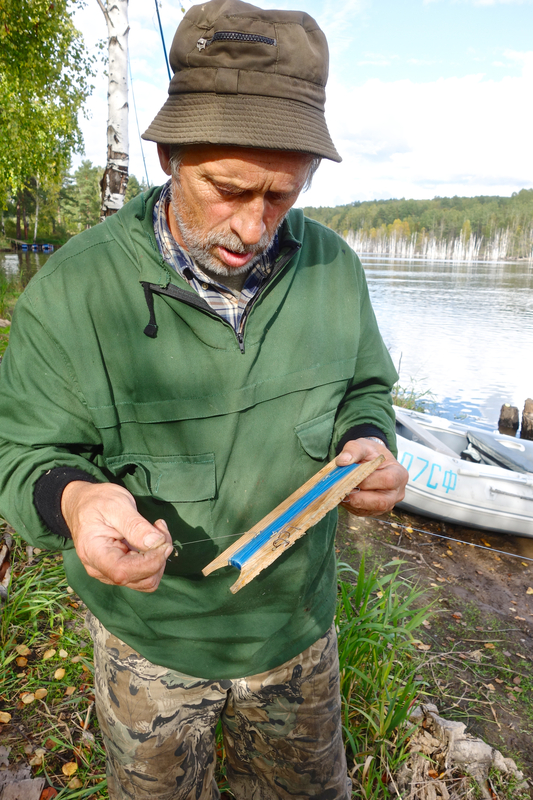 The second consisted of the fourth hunter who remained near our landing and fished, mostly for шука (pike). The first group tromped miles through some very nasty brush, mud, trees, and other hindrances. We walked three abreast with roughly 40 yard spacing, depending on the density of the brush. Charlie did his job, of course, trying to sniff out рябчик. 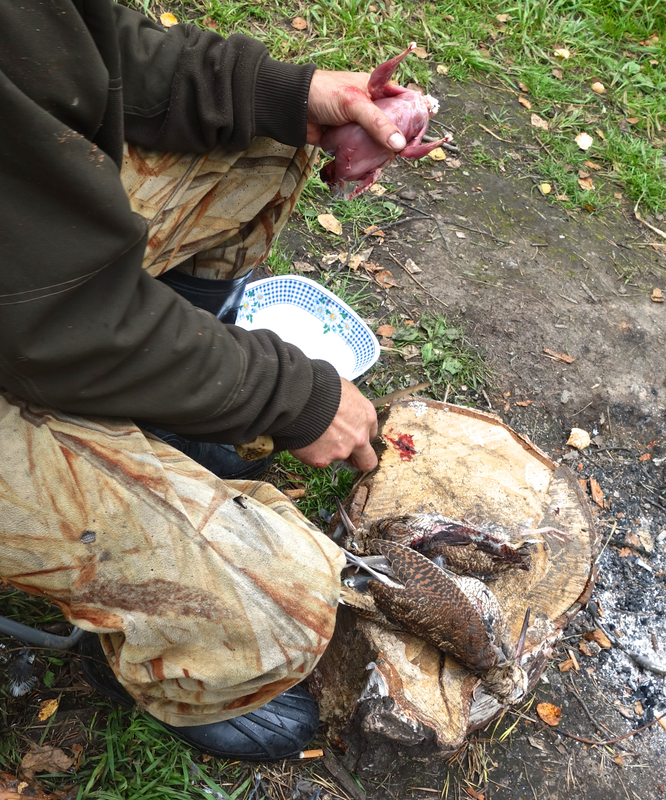 During the course of the hunt multiple doublets rang out, and dinner was nearly in the bag. My fellow hunters bagged a grouse and a woodcock. 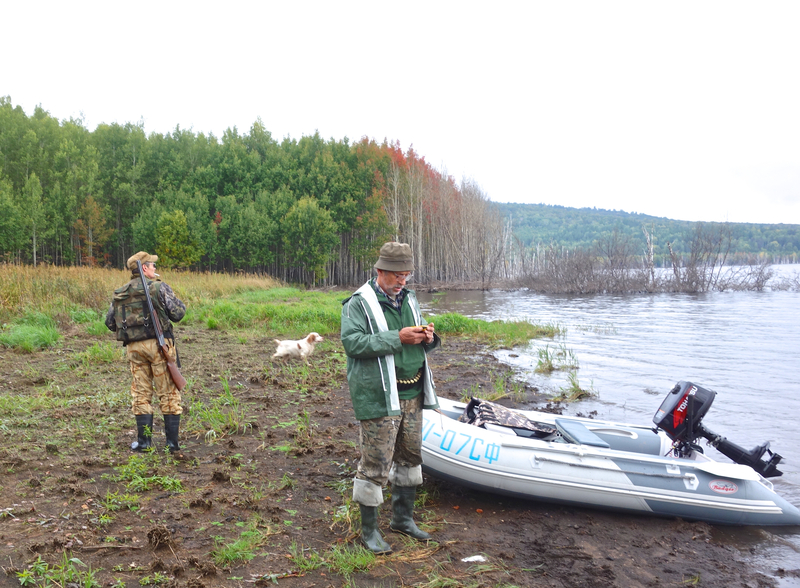 After a good hunt, we turned around, returned to our boats, and returned to camp. 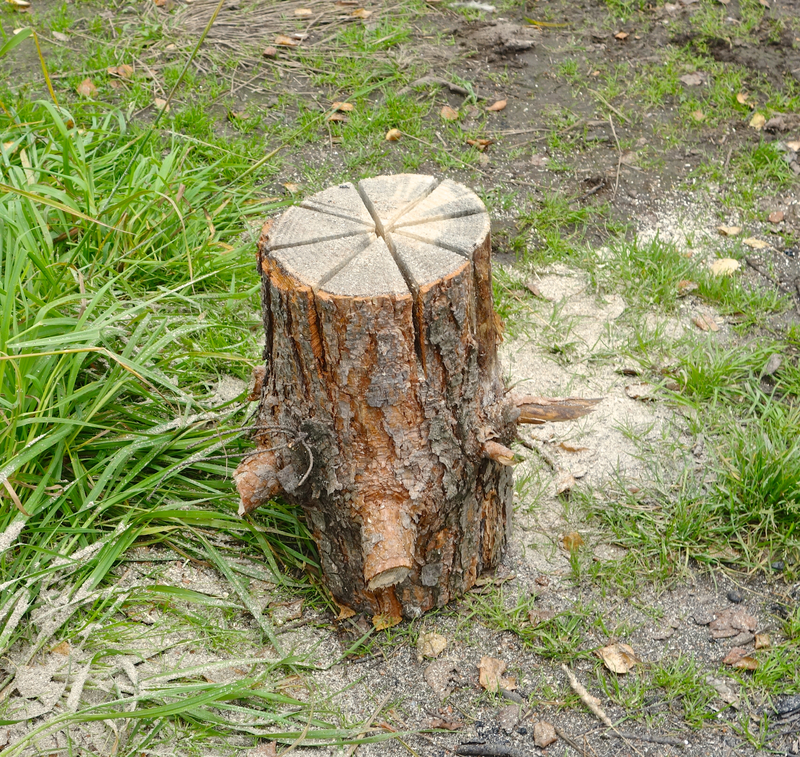 Hunters took the chainsaw and axe to retrieve some firewood that wasn’t soaking wet. 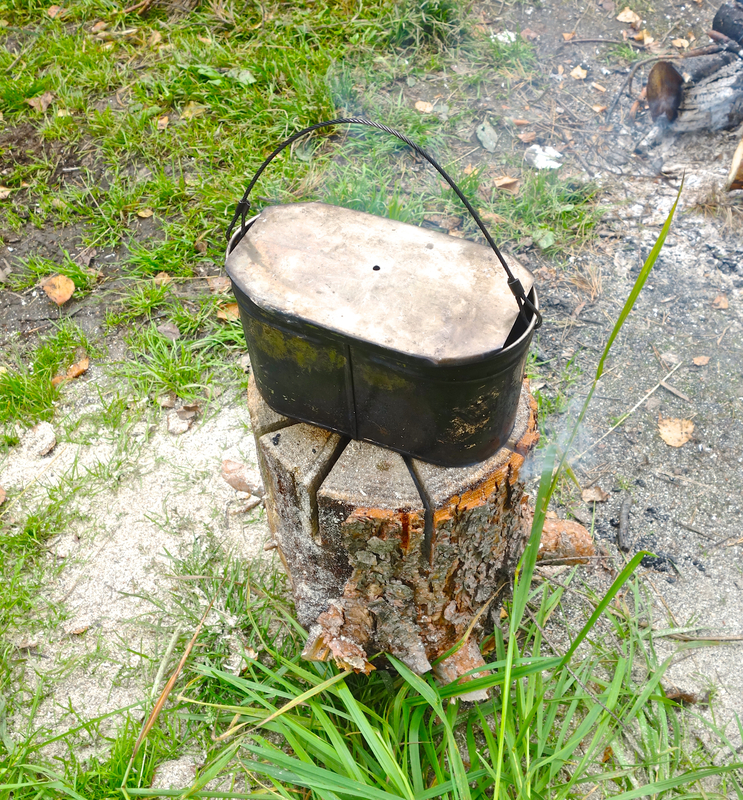 One neat trick was the “Finland” aka “Finnish Camp Stove.” Basically a short log, with 3 vertical chainsaw cuts to provide air to a central flame. It served to boil water. On and off we experienced torrential rains, next time, I think I’ll bring a camping pavilion. 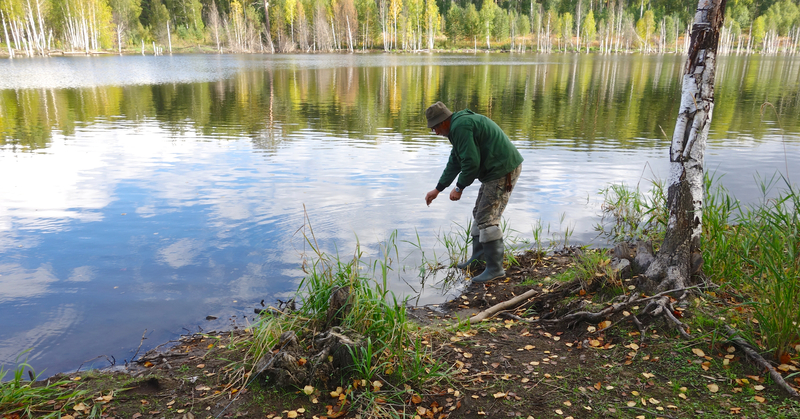 After lunch, my host did some fishing, while others took a brief nap. As the afternoon waned, the same three from the morning boarded a boat, trying to hunt another beaver as the sun set. We traveled to a small cove littered with downed trees, and tied the boat to some partially submerged trees about 20 yards from the shore. We waited, perfectly quiet and still, as the sun set and the temperature dropped. 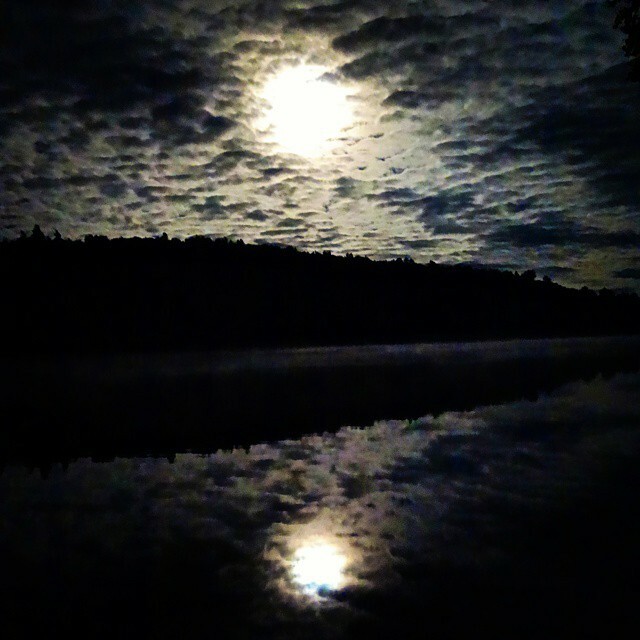 Between the rain, wind, and nightfall, I got pretty cold. Sadly, no beaver decided to join us. 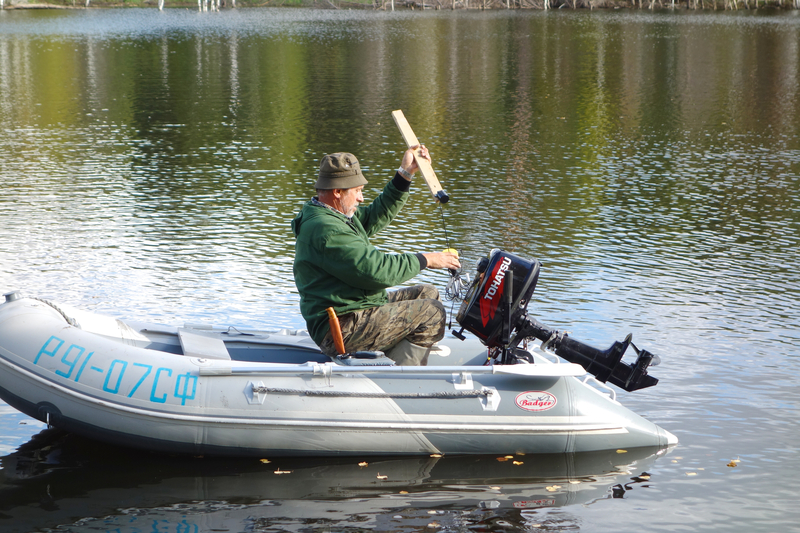 Fortunately, the boat motor started up, and soon we were back to camp. That night, the beaver was filleted, boned, and stewed for several hours. Beaver tasted great, quite similar to the Cuy (guinea pig) I had in Peru. Others have described the taste as the “great beef brisket.” I am inclined to agree. In our case, the meat was fresh and the castor glands had been removed properly, so it was not gamey in the slightest. After dinner, we went to sleep. 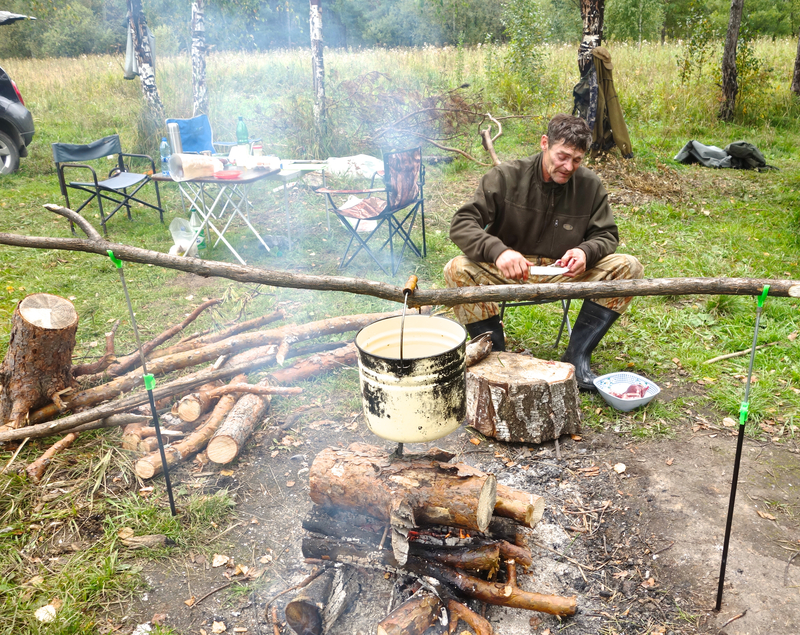 The next day, we woke up, rebuilt the fire, warmed up, and ate breakfast. Aftwards we went for a final hunt. It rained hard, but at least it was warmer than the day before. Two of us, and Charlie went out to try and jump a косуля (Siberian Roe Deer). We had hoped that the rain would partially mask our approach and make it possible to get a shot off as it crossed in front of one of us. Charlie indeed spooked a Roe Deer but it was far too far to shoot given the brush and fact that we were using buckshot shells. I caught a fleeting glance of a second Roe Deer, but again, the combination of brush and range made a shot impossible. Sadly, we saw no grouse or woodcock on Day 3. The walk back to camp was quite amusing as my fellow hunter and I used our twenty word vocabularies to share hunting stories of bear, moose, hare, and deer. Hunting is an international language. 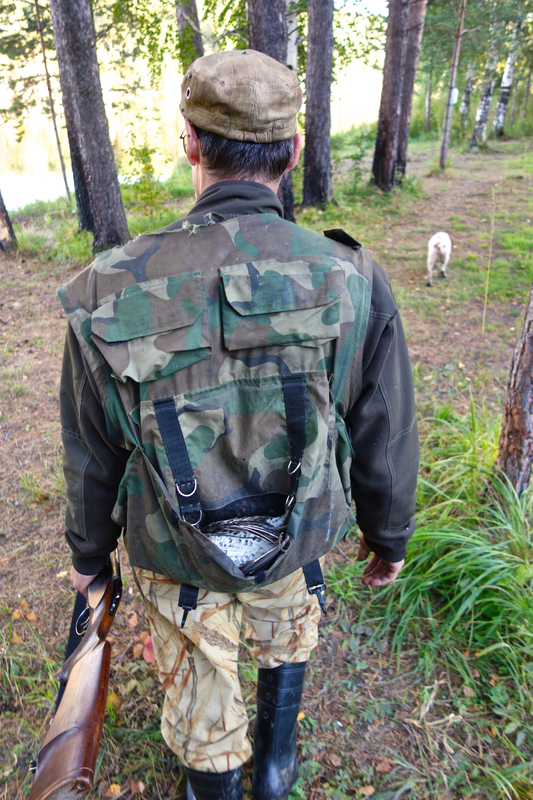 Coming back from the Roe Deer hunt. After calling it a day, we returned to camp and packed up. 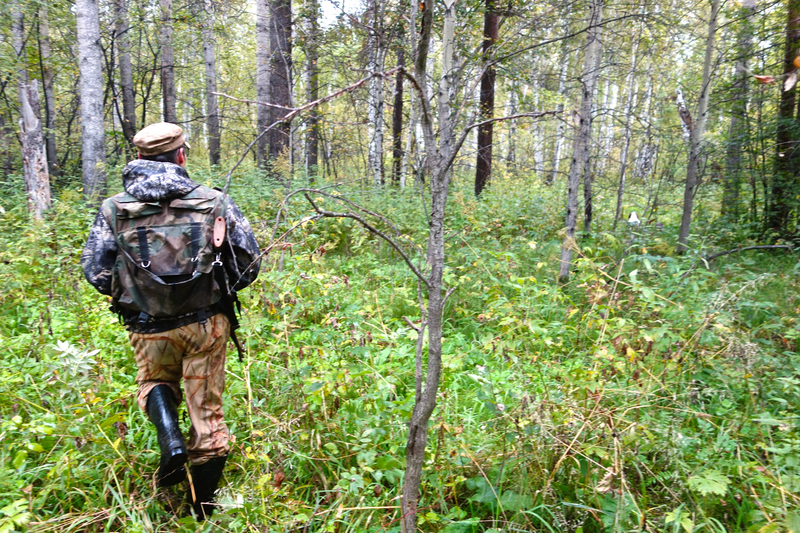 Hunting in Chelyabinsk was one of my most challenging hunts, but also one of the most enjoyable. The language barrier and culture shock were also at times amusing. 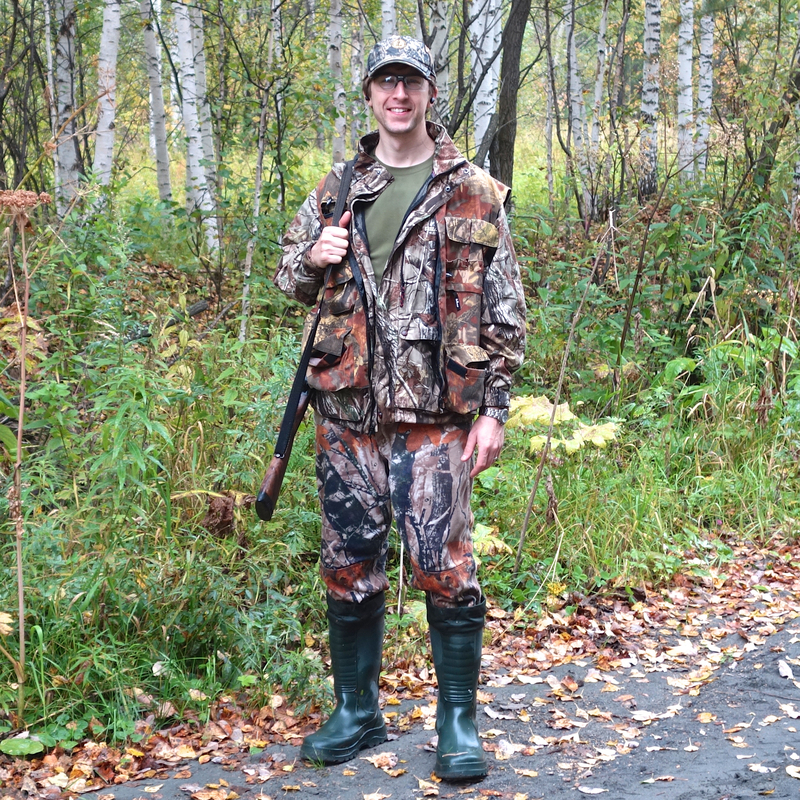 My hosts incredibly gracious to take a near stranger, who couldn’t even speak the local tongue, hunting. 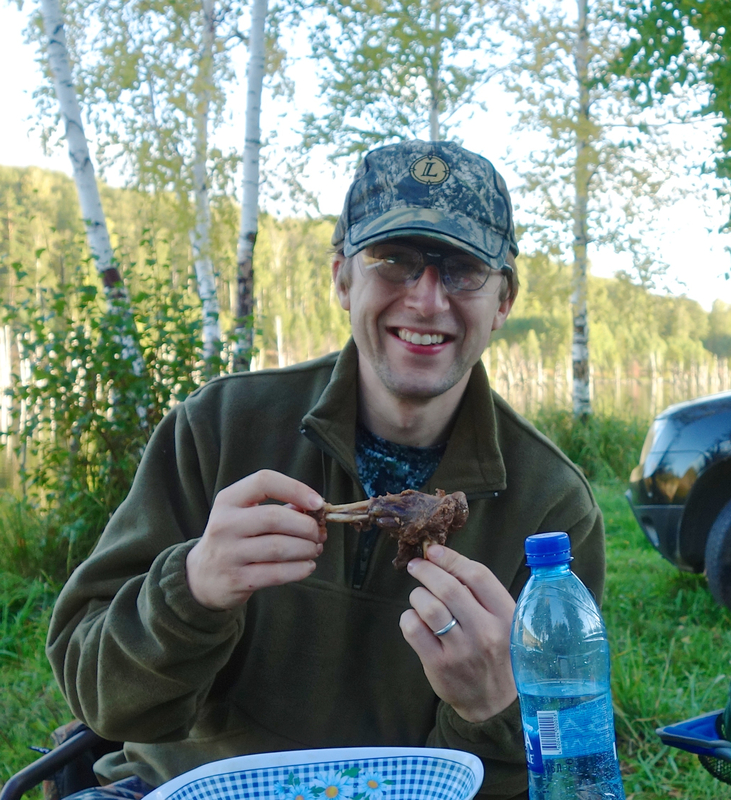 Next hunt, I was assured we would hunt roe deer with rifles, likely in the northern Urals. I hope to come back and make that happen soon.